What is a plant? And why care about them or study them? These may seem like obvious questions. They’re the green things. Some of them we eat and we’ve been selectively breeding crops for ~10,000 years. As you’re reading, I invite you to think about where plants show up in your own life. There is a good part of the globe where plants are green year round. Here in the dead of winter in New Hampshire, however, there is little that is green outside right now. The limited green that is there is the dark green of conifers, not the vibrant green of spring. The majority of plants, big and small, have gone dormant for the winter. Flowering plants are capable of more than green as well. 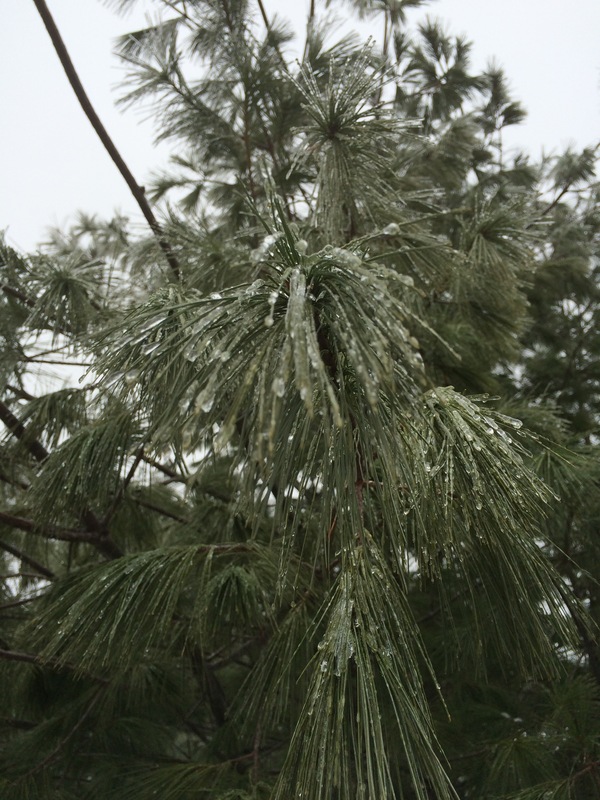 Frozen pine tree, persisting in the winter. Then there are what could be considered tiny (microscopic) plants. Mosses are small plants that we can see and are amongst the earliest plants to colonize the land. And there are even tinier photosynthesizing organisms that live in the oceans that aren’t quite plants, but are the present versions of the evolutionary precursors of modern plants. Single celled algae and what are the most ancient photosynthetic organisms on Earth: The cyanobacteria, commonly referred to as blue-green algae. I don’t know what an evolutionary biologist would say, but I certainly consider algae and cyanobacteria as important parts of plant history. Plants are diverse. 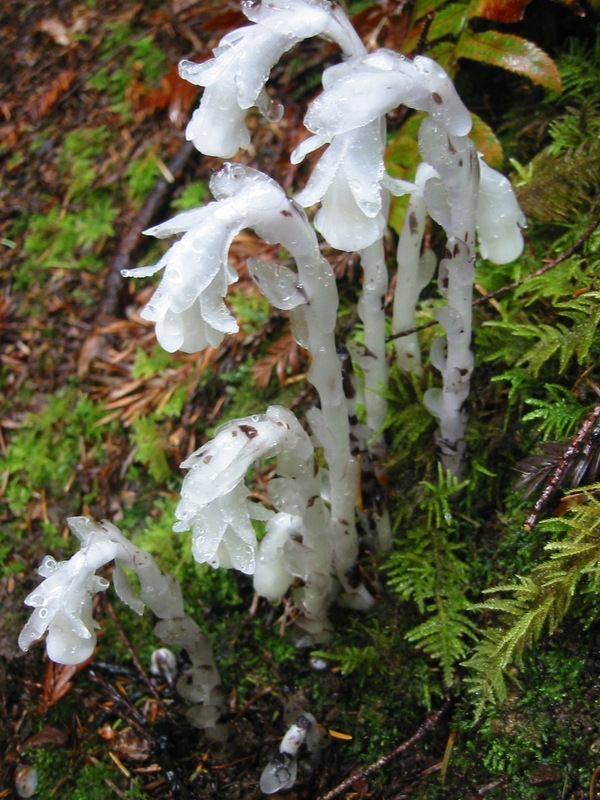 Sticking to plants that live on the land, there are an estimated 260,000 flowering plants in the world, 630 conifers, 11,000 ferns, ~12,000 mosses, ~7,000 liverworts & hornworts, 160 cycads. As the American Society of Plant Biology has as it’s first of 12 principles of plant biology. The rest of the principles are worth checking out to really give a big sense of what plants are all about. Plants build themselves from the air. They use the energy from sunlight to pull carbon dioxide out of the atmosphere to make sugars that can then be converted into all sorts of things the plant needs; the carbon-based molecules that . Much of the rest of what plants need comes from their root systems. Water, nitrogen, potassium, iron, and other micronutrients plants need come largely from the ground. Once plants have garnered energy from the sun, they respire. Just like us, utilizing that energy to carry out biological processes, just like animals do. Yes, plants have mitochondria (power houses of the cell). That’s the physical and some of the biology of what plants are. There’s more. Picture a bison out in the world. Now a deer. Now a Koala. And last a crocodile. Where did you picture these animals? On a plain, defined by grasses, in a thick forested area, in a Eucalyptus tree lounging, and in a mangrove swamp defining the canals where it’s swimming? All of these environments are defined by the plants that are in them. They fade into the background as we track the movement of animals, but they are no less present. Plants are everywhere and nearly every-when. Photosynthesis started billions of years ago with cyanobacteria (they can be thought of as modern plant precursors) and oxygenated the atmosphere, making life as we’re familiar with possible though it’d take half a billion years for modern humans to appear. When modern humans first walked the Earth, we were no less reliant on plants as part of our diet, for tools (think spear shafts, arrows, boomerangs), and eventually fire and shelter. Plants are the notebook paper, the wood part of the pencil, perhaps a component of the ink in a pen. The coffee is the product of a plant grown throughout the tropics and it may have been made by pouring hot water with coffee in a paper filter. The ceramic mug the coffee is in was likely fired in a kiln that either used wood or natural gas as a heat source (the former was recently part of a tree, the latter as generated millions of years ago from largely dead plant material buried in the ground). And the wood table had to be crafted from lumber made from a tree. Likely the coffee shop is partly made of wood too. Perhaps you’ve just come from yoga practice and have your partially rubber or Jute mat sitting next to you. Even if most rubber is synthetic now, originally, rubber came from a tree. All of this is what plants are too. Plants show up everywhere, not just in the things we use every day and literally half the air we breathe (the other half being generated by those bacteria and algae that photosynthesize in the oceans). More than the physical world that plants define, plants are of high cultural importance as well. 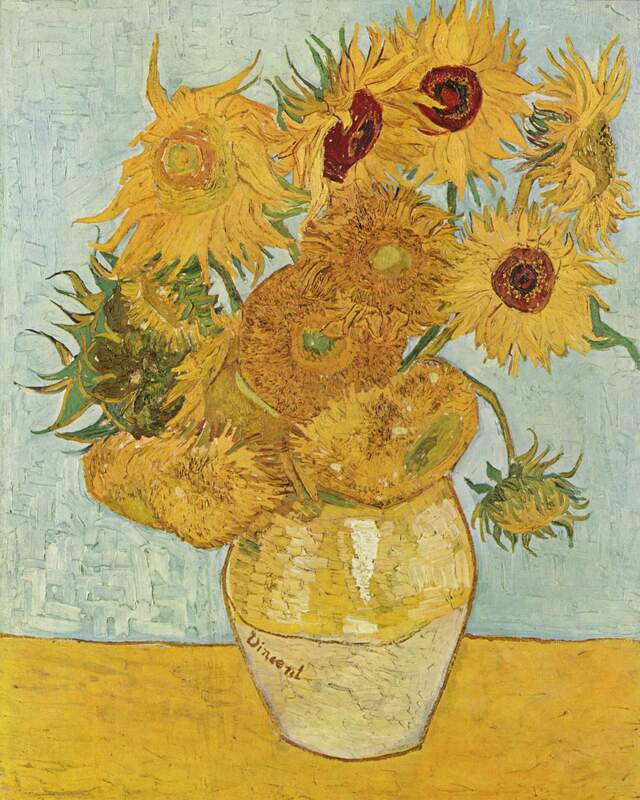 Van Gogh famously painted sunflowers, some of them partly wilting. To me, it’s a meditation on life and death. The bright sun of life and eventual senescence. Gather your sun and produce your huge flower while you can. A few years ago, a naturally occurring genetic mutation was discovered that accounts for the appearance of some of the flowers was published in PLOS Genetics. That’s just one example. We give flowers to people for all sorts of reasons. Romance, condolence, or just a random act of kindness. The plants we cultivate and live with also affect our culture. The art of Bonsai in Japan, the cultivation of trees through very meticulous and precise pruning. It’s a meditative and mindfulness, and deliberative practice. Many Americans can’t start their day without a morning cup of coffee. In India, the Holi festival traditionally uses plant-derived dyes that fill the air with clouds of color that get all over(since come to the US in forms like The Color Run that uses dyed corn starch). The number of products corn ends up in is astounding. It’s not just food for animals or us, it gets processed into all sorts of other things as well, like make-up and part of spark plugs. All of these things are plants. We are intimately connected with the plant world, even in our urban jungles supposedly cut off from the natural world. This might be considered an invasion If it weren’t for the fact that plants were here long before us. We’ve carved out a niche in their world and in some cases molded them to be better for us. Some plants are invasive or labeled ‘weeds’ and cause humans problems, but that is largely a product of us moving them around the world. Plants are living things, just like us. They are made of cells, have DNA and grow, develop and reproduce, creating the next generation as well. They are dynamic too, though mostly in an unnoticed way by humans. A lot of what goes on in plants happens on the inside and isn’t as obvious to human eyes (as I said in the first post, this is one reason why they are nature’s introverts). The plant world is vast and important, essential to our lives. They’re a medium in which we exist. Even plants that live thousands of miles away from us. And I didn’t even mention medicines and many other useful products we get from the plant kingdom. I hope this post has given you some answers to the initial question of what plants are and why some scientists see them as worth studying. All of us have a self-interest in plants. They sustain us. For the above reasons and more, plants are important and worthy of study by scientists from basic to applied research.